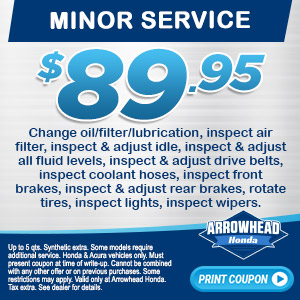 Change Oil, Replace oil filter w/Genuine Honda Oil Filter,Lubrication,Inspect Air Filter,Inspect & adjust idle,Inspect & adjust all fluid levels,Inspect & adjust drive belts,Inspect coolant hoses,Inspect front brakes, Inspect & adjust rear brakes,Rotate tires,Inspect lights,Inspect wipers,Some models require additional services. Must present coupon at time of write-up. Hondas & Acuras only. Valid only at Arrowhead Honda. No additional discounts apply. 0W20 oil add $10.00 Hondas & Acuras only. Valid only at Arrowhead Honda. No additional discounts apply. 0W20 oil add $10.00 $150 Maximum Discount. HONDA & ACURA ONLY. MUST PRESENT THIS COUPON AT WRITE UP. $150 MAXIMUM DISCOUNT. CANNOT BE COMBINED WITH OTHER ADVERTISED SPECIALS OR ON PREVIOUS PURCHASES. SOME RESTIRCTIONS APPLY. SEE YOUR SERVICE ADVISOR FOR COMPLETE DEATILS.